My new favorite snack is oil-packed sardines smeared on grilled bread with a pinch of sea salt. If you already feel yourself developing an aversion, stay with me. This little fish is only fishy in the slightest, fresh from the sea way. It's a bit like tuna, just imagine the flavor being more succulent and buttery. With a newly discovered ingredient, it was only a matter of time before it made a debut in a more substantial meal. As much as I love and adore pasta, it's been a while since I've posted a new recipe. The dark evenings made it difficult to take photographs, so, as often happens in winter, many dishes never make it to the blog. But now that the time has changed, light has finally returned! The combination of flavors and textures here really satisfies me. The roasted tomatoes and sardines combine to make a luxurious sauce, and the breadcrumbs waste no time sopping up the juice. On the sustainable front, sardines reproduce rapidly and are filled with nutrients that make them a great addition to your diet. They're also affordable, so even if you're skeptical, it's definitely worth a try. Toss tomatoes on a large sheet pan and coat with olive oil, salt and pepper. Roast at 425 degrees for 25-30 minutes, or until their skins are bursting and beginning to char. In a sauté pan, warm ¼ cup olive oil over medium low heat. Add bread and toss to coat. Season with salt and cook, stirring occasionally, until the oil is absorbed and the crumbs are golden brown, about 12 minutes. Set aside. In a large pot of boiling, salted water, add penne and cook for 6-7 minutes, until al dente. Drain, reserving some of the starchy pasta water. 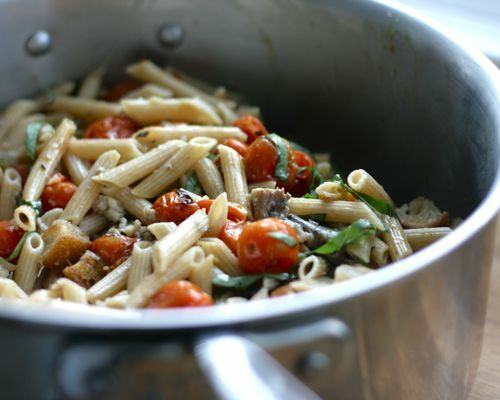 Return pasta to pot, then add tomatoes, sardines and a little bit of their juices, a few tablespoons of the pasta water, a glug of olive oil and the basil. Toss until the pasta is well coated with all the ingredients, then add the breadcrumbs. Serve with Parmesan cheese.